1 Separate egg (save egg yolk for another use). Beat egg white and salt with a hand mixer in a tall vessel until stiff. Sprinkle in sugar and beat well. 2 Use a tea strainer to sift powered sugar over mixture. Beat briefly. 3 Mix 2 tablespoons shredded coconut with egg whites and pour into a piping bag with a star tip. 4 Line a baking sheet with parchment paper and pipe 12 strips of meringue, each about 7 cm (approximately 2 3/4 inches) long. 5 Sprinkle with shredded coconut. Bake in preheated oven at 80°C (fan: 70°C, Gas: not recommended)/approximately 175°F (convection: 160°F) until dry, about 2 ½ hours. 6 Meanwhile, rinse elderberries, drain in a sieve and pluck from the stems. 7 Place berries, apple juice and apple juice concentrate in a pot. Bring to a boil and cook for 10-12 minutes on low heat. Remove and set aside 4 tablespoons of the elderberries. 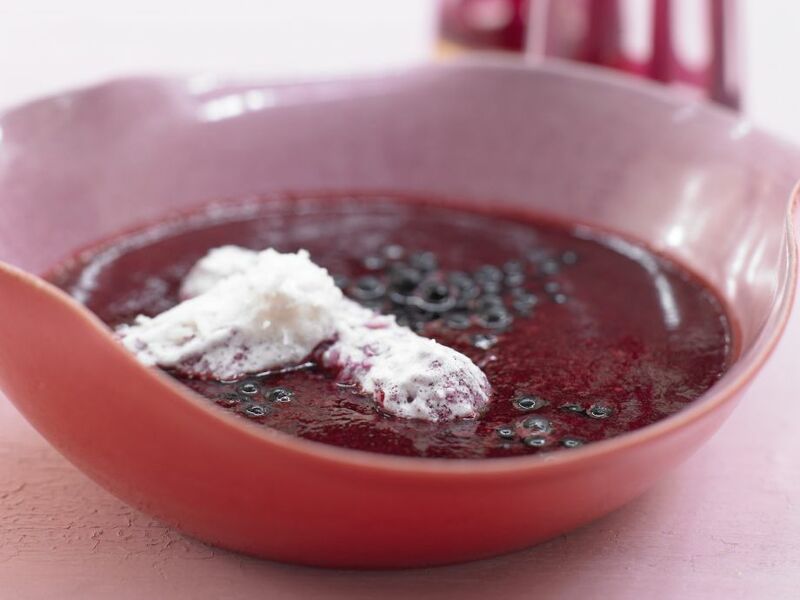 8 Puree remaining berries in the cooking liquid with an immersion blender and pass through a fine sieve into a bowl. Season to taste with liquid sweetener, let cool and refrigerate. 9 Cool dried meringue bars on a wire rack. Garnish chilled soup with reserved elderberries and serve with meringue bars.